SuperChimney Max in 7" diameter carries a 10-year prorated warranty. Max has been tested and listed to UL's 103HT Standard. The manufacturer approves its use for wood, oil, coal, and gas. 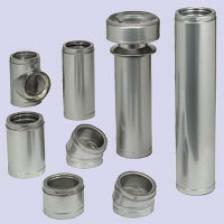 The couplers and the chimney's inner liner are made from 304-alloy stainless steel. The outer wall is 434-alloy stainless steel. Most of the components for SuperChimney Max are the same as those for SuperPro Class-A Chimney. The exceptions are the cathedral ceiling support box which does not have brass trim, the decorator ceiling support and black wall thimble which come with round trim collars with no brass trim, and the trim collar itself which measures 16" round and does not have brass trim. The SuperMax couplers are embossed, not cut, to reduce moisture penetration. This greatly increases the longevity of the chimney. SuperMax features twist-lock connections; however, locking bands are recommended at each joint for extra security when cleaning and are required on elbows. Black Stovepipe Adaptor; SuperChimney 7"
Tee with Plug; SuperChimney 7"
Round Trim Collar; SuperChimney 7"
12" Chimney Length; SuperChimney 7"
6" Chimney Length; SuperChimney 7"
18" Chimney Length; SuperChimney 7"
24" Chimney Length; SuperChimney 7"
36" Chimney Length; SuperChimney 7"
15Deg Elbow Kit; SuperChimney 7"
30Deg Elbow Kit; SuperChimney 7"
FireStop Attic Shield; SuperChimney 7"
FireStop Radiation Shield; SuperChimney 7"
Deluxe Rain Cap; SuperChimney 7"
7 Supervent SS Spark Arrestor; SuperChimney 7"
Roof Support Kit; SuperChimney 7"